Focusing is an innate gift that we all can access. For me it has been a way to opening to a sense of joyful, open-hearted and infinitely compassionate Well-Being that can hold all the aspects of me that need attention and care. Best of all, for me, is the knowing that it is my body and its connection to all Life that is a home for the Well-Being so that ‘I’ don’t have to change or sort out anything that arises. Life is our teacher and it is by learning to open to both Well-Being and our personal history/traits/concerns about the world that we can come Home and over a lifetime or more develop as a potential source of Love in the world. 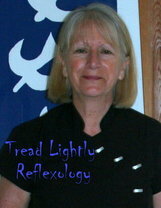 I am a Reflexologist and very interested in incorporating Focusing into treatments but also very happy to offer either separately. More on this later!